Single hop. 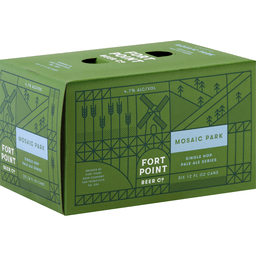 Fort Point Beer Company: 644 Mason Street SF CA 94129. Subtle, textured and introspective, Mosaic Park is a single hop pale ale with quiet depth. Our house yeast builds a distinctive, well-rounded base, which in turn helps accentuate Mosaic hops' full palette of flavors: berries, grass, grapes and papaya. This is a beer for winding down - the perfect accompaniment to a rooftop sunset, or watching the fog roll in after a day at the beach. Follow us: Twitter & IG: (at)Fortpointbeer. Facebook:/Fortpointbeer. Fortpointbeer.com. 4.7% alc/vol.